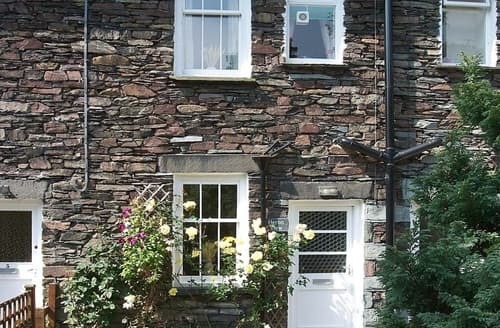 What our customers are saying about our Holiday Cottages In Grasmere To Rent. 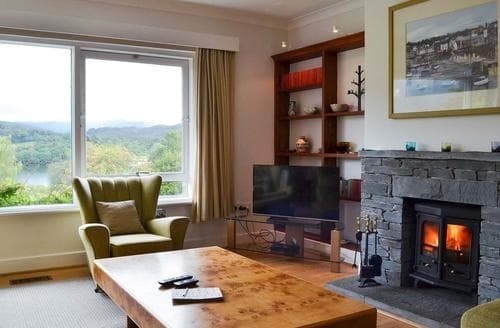 "The apartment is in a wonderful location, a little way from shops and pubs etc but quiet and peaceful with lovely views across Grasmere to the fells above. 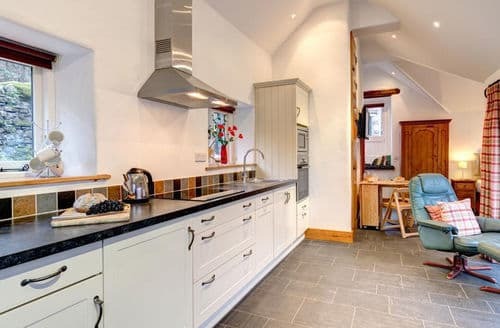 All the fitments are in keeping with a Victorian residence which is mostly lovely but the bathrooms are a little quirky and function ok, great to have two though. 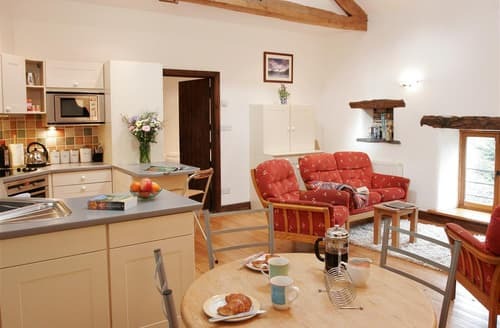 The sitting room and kitchen are very easy to live in and we found the wifi strength good throughout our stay. 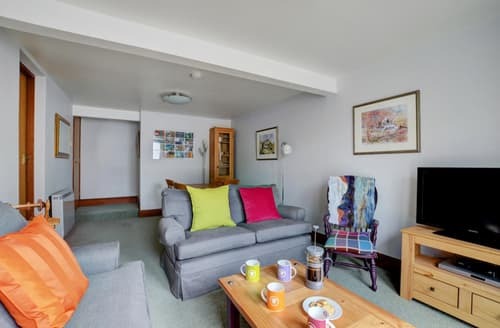 No one with mobility issues will stay there due to the steep steps to the property from the parking area, down near the main door and down from the kitchen to the sitting room. 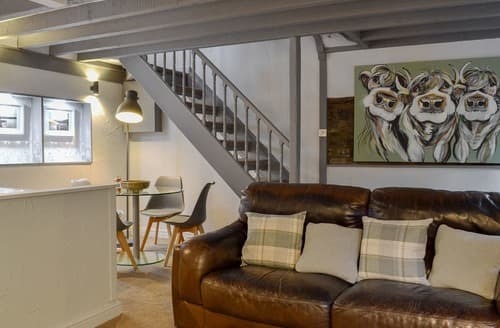 Also, the steps to the charming upstairs double room are steep with narrow treads, especially with a suitcase, so should be borne in mind if this might be difficult for you. 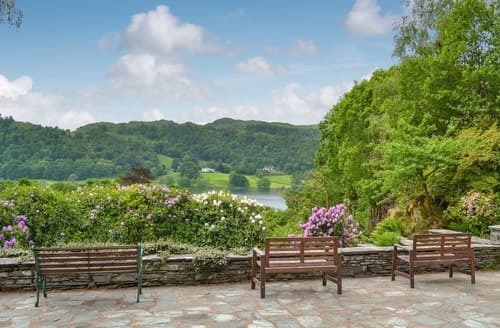 The 2 twin rooms are downstairs so provide other options though we found one was disturbed by a pump that seemed to run at intervals through the night.The terrace is wonderful and very private - excellent to come back to after a day out and watch the changing light on the lake and hills. 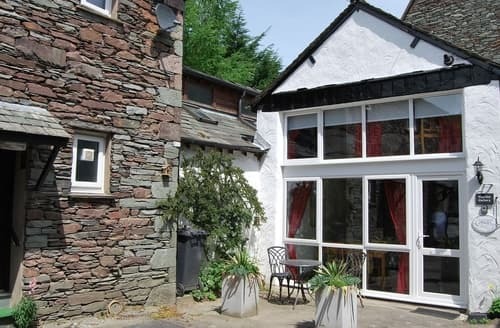 It was so sunny during our stay that I thought a sunbed would be a good addition to the terrace furniture but maybe it would not be needed that often!It was great to have washing machine and tumble dryer, the kitchen is set up with a good range of cooking kit and crockery. 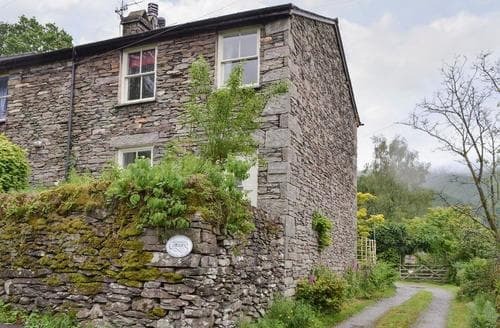 All in all a lovely property." 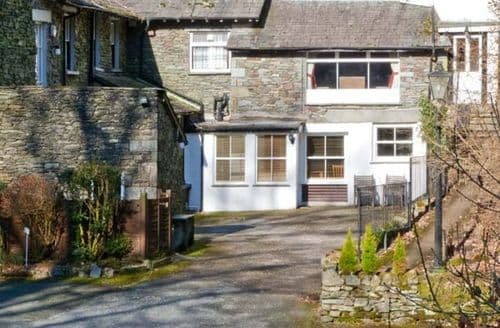 "Wonderful view of Grasmere and ideally located for walks to Rydal and over into Langdale. 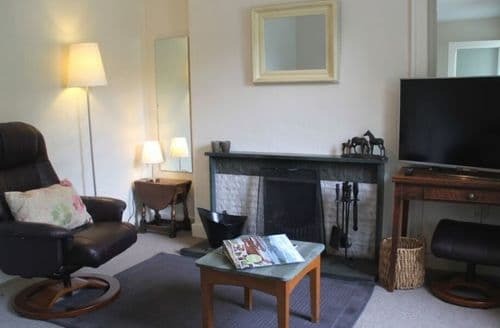 Really an apartment rather than a cottage as the property is an integral part of Huntingstile House. Lovely gardens, patios and a charming entrance. Very secluded. Inside, the kitchen has everything you would expect, but some of the cabinet doors are very worn and cracked. 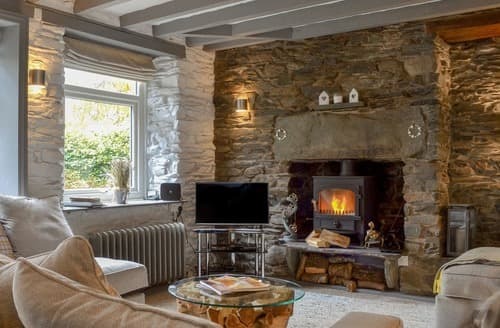 The lounge is excellent and very cosy with real style and quality. 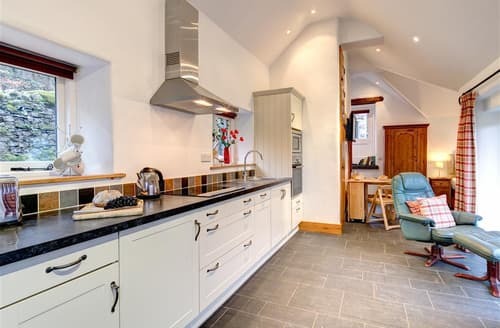 The double bedroom is up a very narrow and steep staircase and the en suite loo is in a very small space. The twin room beyond the bathroom is in need of redecoration and the water pump noise intrudes all night every few seconds. The main bath and basin taps are in need of renewal and the tile grouting is very old. Also, behind the net curtain, the inside of the window frame was black with mildew. However, the whole property was really warm and comfortable. We were surprised, though, that there was no welcome pack, not even a pint of milk. There were some tea bags and an empty coffee jar ! 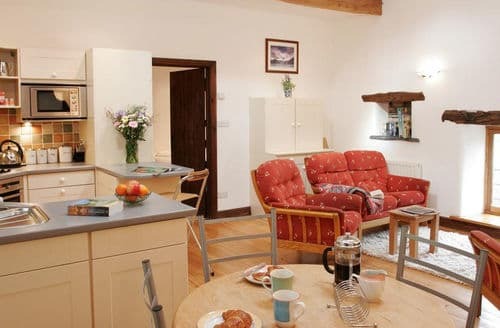 The whole ambience of the property was stunning, thanks to its architecture and location but for the sake of some inexpensive updates, a few cleaning oversights and £10 worth of milk, tea, coffee and even gingerbread, it could be outstanding.I would definitely book this again"
"Downstairs ok but everything very dated. Bedrooms cramped, upstairs dreadful- 1 bed had a mattress which was not the right size and was extremely lumpy, the double bed and bunk beds were worn, looked like could break at any moment and springs through the mattresses. None of us slept much and all had backache. The bathroom stunk of damp, it is carpeted and over time the bath with shower attachment but no screen has over time caused the damp. Upon arrival we couldn’t open the front door as it had dropped in the rain, someone was sent out (half an hour which could have been longer), he took some time to fix the door. It was then ok apart from the last day after a lot of rain, the old wooden door had swollen again and was a challenge to open. No advice that only a small car is suitable to be parked there in the space available and to get into the drive- very tight stone fences on the road. We would have changed accommodation but everywhere was full. Left early on ththe last day as we’d had enough of virtually no sleep and we all had back ache!!" 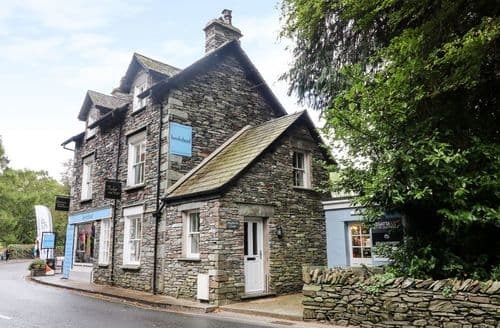 "We have had 15 self catering holidays in the lakes and this is one of the best cottages overall we have stayed in. 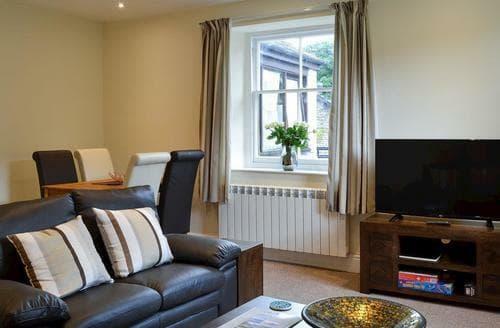 It is in an excellent location and roomy enough for a family of four. The kitchen is well equipped and clean. We prefer a bath to a shower so the lack of shower wasn't important. The bath was lovely and large with a great view. We had no issues with hot water. The lack of WiFi was also a plus for us. (We are however bt customers and the kids could pick up a bt hotspot in front bedroom and garden). The PS2 was also appreciated by teenagers who were up for a trip down memory lane. Did not need heating in August. 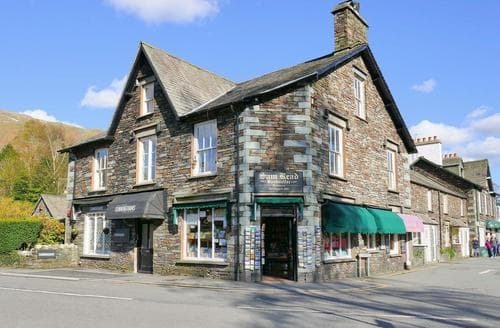 We liked being away from the village centre but it was an enjoyable stroll in the evening or to visit the shop. Had a great walk up Easedale to High Rise with sublime views. It was great to be able walk from the door. 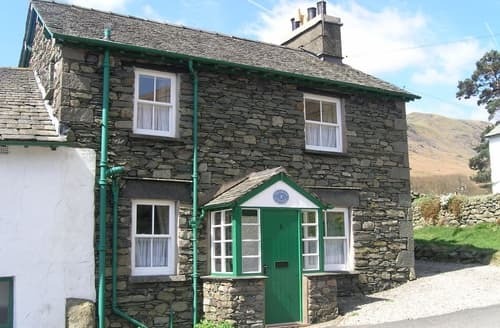 A fantastic holiday in a homely cottage. 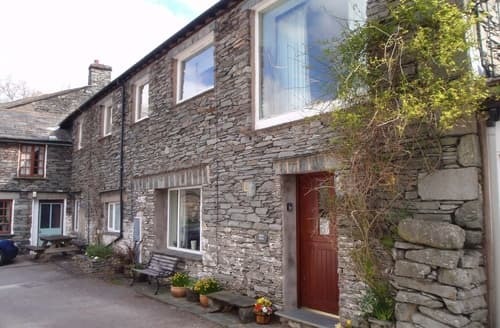 An excellent 3 star value property." 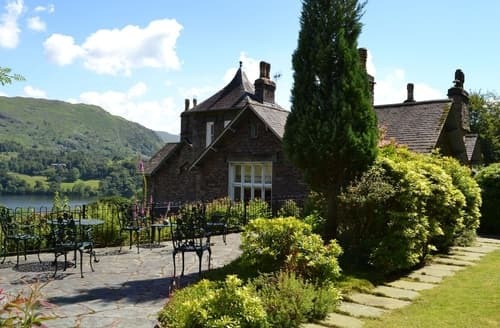 "We had a perfect week at S86207 House, especially as we were lucky with the weather! 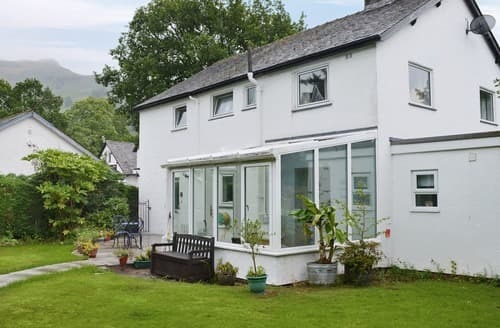 The house has beautiful views over Grasmere and is a easy walk into town to the Co-op, cafes, and pubs. 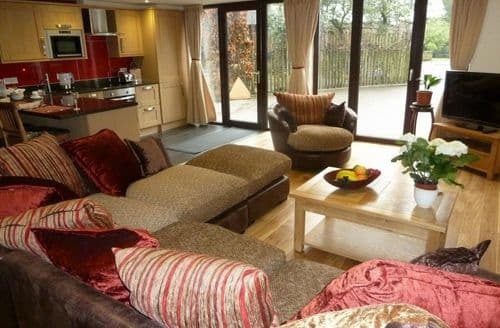 The house itself is extremely spacious and is perfect for families as it has separate rooms for relaxing, entertaining, doing a jigsaw. 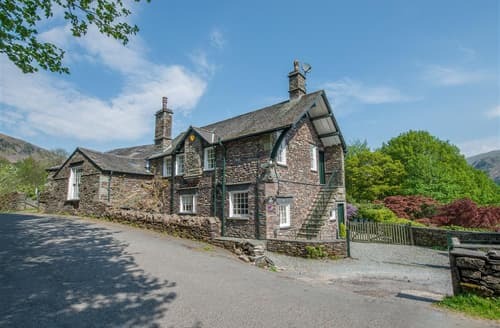 It's worth mentioning as the house is a bit older, a few things need fixing, but it didn't effect our enjoyment of the house or holiday. 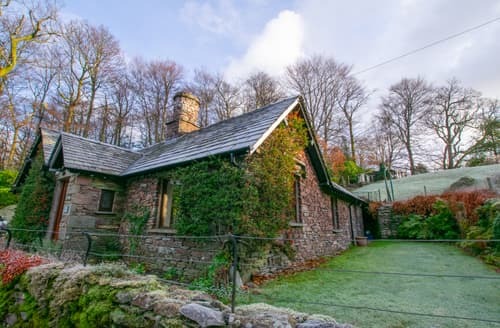 It would be great if the owners could provide a notebook with instructions on the house (where to find the first aid kit, where to find the extra fridge, why is the house called S86207?) and personal suggestions on local walks and restaurants, etc. Also worth mentioning, that although there is an outdoor table, it doesn't look out over that gorgeous view. We drank our Rose' on the porch, which was nice, too. Thumbs up from us!"